Professional football players aren't the only ones taking hits on the field these days. According to a new POLITICO/Morning Consult poll, the National Football League is seen as more unfavorable than ever before. "The NFL's net favorability has dropped from 30% on September 21 to 17% on September 28," the poll shows. Naturally, among Trump supporters the NFL's rating is in the toilet. These numbers are obviously a result of players refusing to stand for the National Anthem and disrespecting the American flag, which President Trump brought magnified attention to this week. 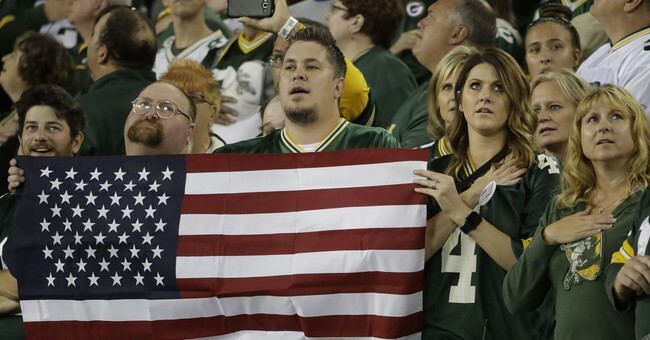 During Thursday night's NFL games, players stood and locked arms during the Anthem rather than kneeling as more than 200 players did over the weekend.